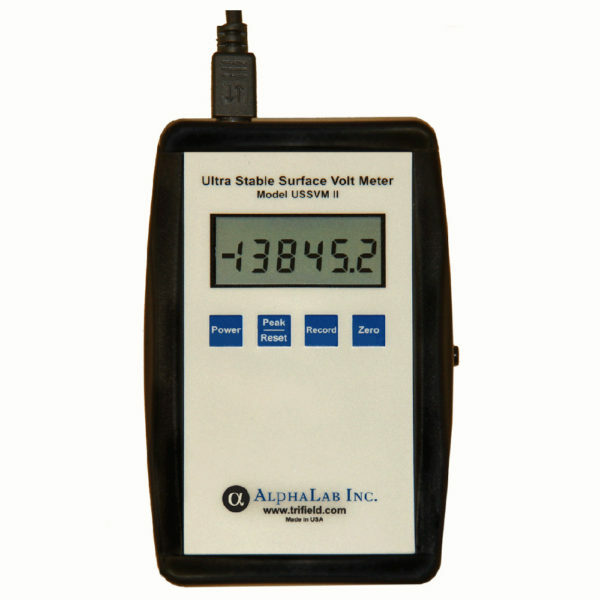 Ultra Stable Surface DC Volt Meter USSVM2 - AlphaLab, Inc. The Ultra Stable Surface Voltmeter Model USSVM2 utilizes a sensor shutter/switcher technology which provides long term stability without drift. This technology also eliminates false or offset readings due to charged air molecules (air ions). The sensor has a 29 inch detachable cable which can be extended up to 9’. 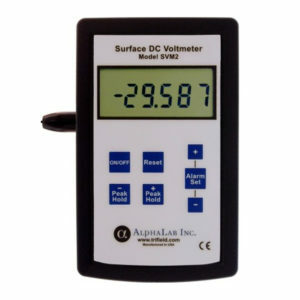 The meter measures the magnitude and polarity of static charge on objects or surfaces. The sensor is calibrated for measuring a surface at 1” from the end of the sensor. On metallic or conductive surfaces, the meter measures the voltage on the surface. (As with any electrostatic voltmeter, the displayed reading depends somewhat on the size of the object being measured and the distance between the object and the sensor.) On insulating surfaces, “voltage” is not a well-defined number. In this case, the meter reads a number proportional to the static charge present. The SVM2 has high sensitivity (resolution), and can detect even a 1/10 volt charge anywhere within its full range of +19,999.9 to -19,999.9 volts. Thus it is easy to measure whether a given process is increasing or decreasing the static electricity present, even if the increase or decrease is by a tiny fraction. A peak hold function displays the highest positive or negative level measured since the last time that the peak hold values were cleared. The peak value is the maximum deviation from zero, and the polarity is indicated. An analog output jack provides a DC output voltage of +/- 0 to 2 volts which proportionally corresponds to the display measurement of 0 to 20K Volts. USB port allows reading to be recorded and uploaded to a PC. Real-time data streaming is also supported via the USB Port. The location, strength and polarity of all static sources. NIST traceability calibration certificate included. USB Data Logging with AlphaApp.